Noise Industries has released FxFactory for Final Cut Studio, a collection of real time visual effects packages available for Final Cut Pro and Motion. More than thirty transitions, generations, and filters are available as a compositing package for Motion and an editing package for Final Cut Pro. The company's FxFactory Pro adds forty-six plug-ins to these two collections, and the ability to create, customize and share visual effects with other users -- all without writing any code. The company maintains an Effects Market at its web site to share or sell plug-ins developed by third parties. FXPlug architecture. These Noise Industries and third party products are based on Apple's FxPlug architecture, which leverages the OpenGL capabilities of your video card and the image processing capabilities of Apple's OS X Core Image and Quartz Composer technologies. Visual effects can be authored in the node-based environment of Quartz Composer as a transition, generator, or filter. These quartz compositions are converted into FxPlugs for use in Motion and/or Final Cut Pro using FxFactory Pro. The process is straightforward and requires no code writing capabilities. The company provides several resources to aid in this task, including tutorials. More resources are available on the web. 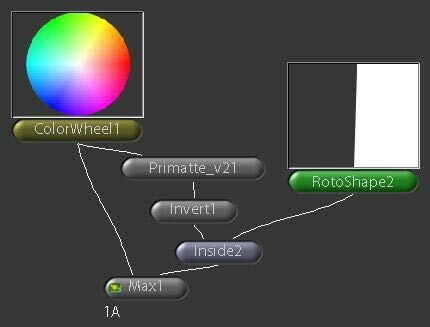 Simple filters are fairly simple to create, as noted below. However, more complex creations require a deeper view of how Quartz Composer works. An Overview. Apart from the unique authoring capabilities of FxFactory Pro, the composition and editing packages provide some interesting visual effects. The plug-ins are installed into the Generators and Filters categories of your Motion application and to the corresponding places in Final Cut Pro. 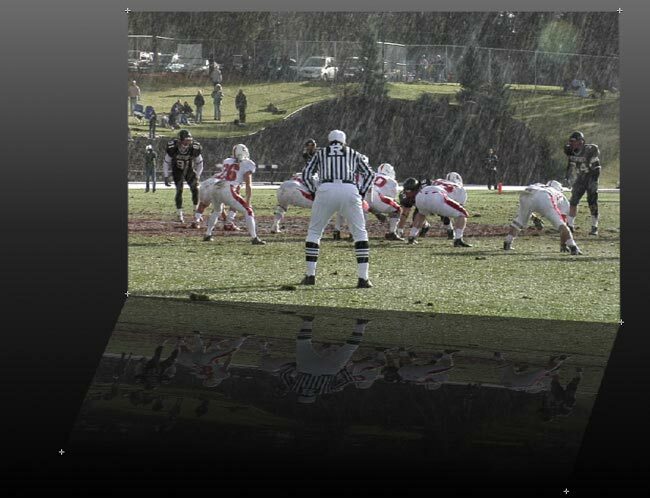 The Perspective Reflection filter also provides unique treatment of the same footage, and the capability to modify it with eleven parameters. Note the arrows that permit the reflection to be adjusted. 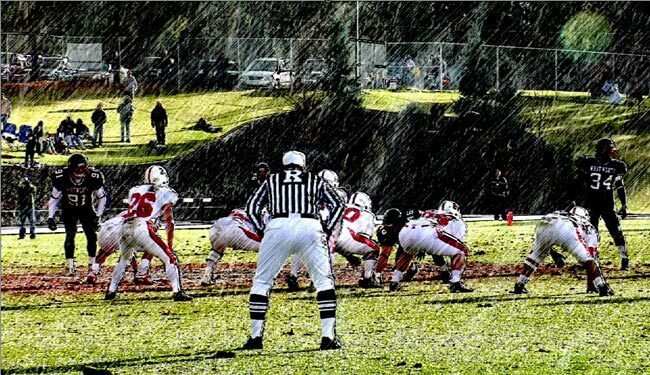 Ten categories of filters install in Motion, each delineated by the "NI" moniker: Blur, Color Correction, Distort, Glow, Halftones, Image Behaviors and Processing, Masking, Sharpen and Stylize. 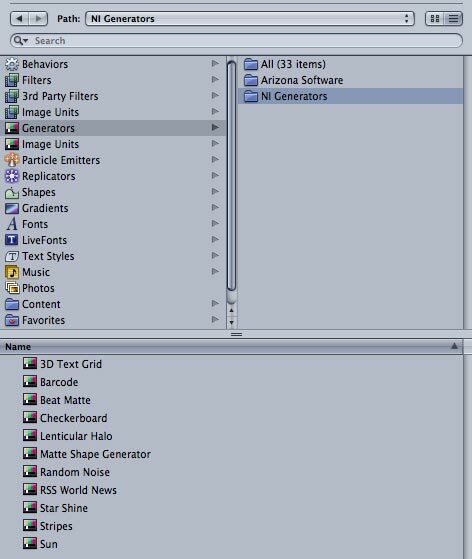 Each category contains multiple filters, including twenty-nine in the Stylize section, eight in the Glow section, and several unique looks in the other categories. Some are truly unique, such as 3D Grid, Lit Sphere/Map/Ventilator Shaft. Others are variations on themes, such as Edge Work, Night Vision, and Witness Protection. Noteworthy in the Generators category are 3D Text Grid, Barcode, RSS World News, and Star Shine. The filters, generators, and transitions are detailed at the company's website. A trial version is also available. The effects played exceedingly well in both Motion and Final Cut Pro, which attributable to their FxPlug framework. I tested each filter, transition, and generator in both apps with various DVCProHD clips, and experienced no crashes or hangs in either app. This was a first for me when using third party plug-ins, particularly with Motion. The FxFactory filters and transitions installed and were accessed uneventfully in Final Cut Pro 5.1.2. Generators are located in the drop down menu in the viewer. Note that not all Generators are available in both Motion and Final Cut Pro. 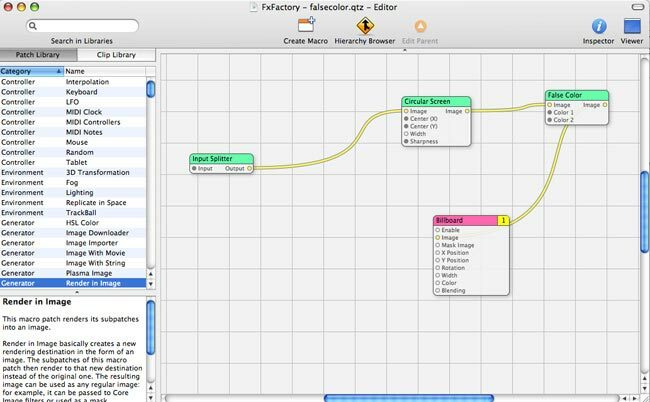 FxPlug Authoring in Quartz Composer. 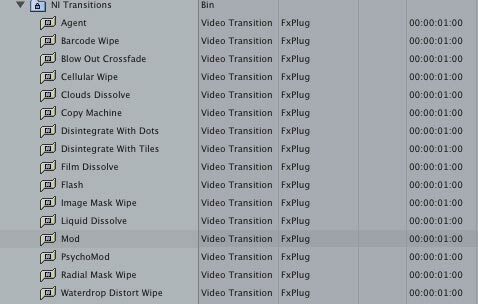 Noise Industries provides a tutorial on authoring FxPlug filters for use in Final Cut Pro and Motion. 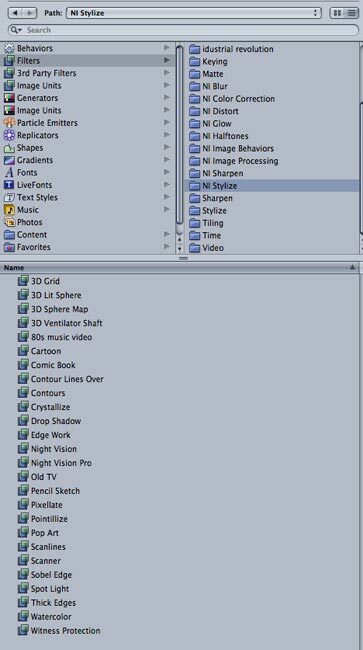 The tutorial requires Apple free authoring application, Quartz Composer, which can be installed from your OS X discs bundled with your Macintosh. Quartz Composer is a node-based authoring environment that uses a similar interface to Shake, Apple compositing environment. The tutorial is accessed from the Help menu of FxFactory. Other video tutorials are available at the company's web site. The filter I created provided two modifiable colors to a video clip as well as sliders to modify three other parameters. 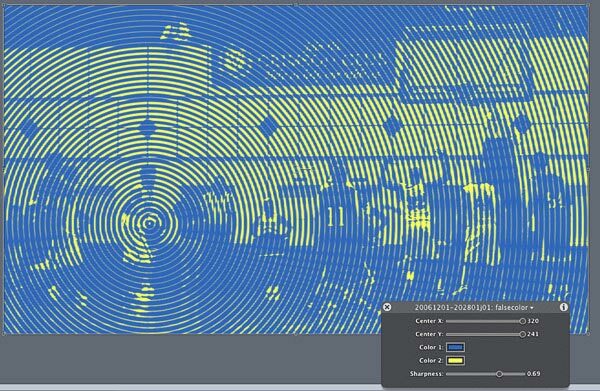 Save the quartz composition, open FxFactory Pro, and install the new filter into whatever folder you have established for your custom visual effects. 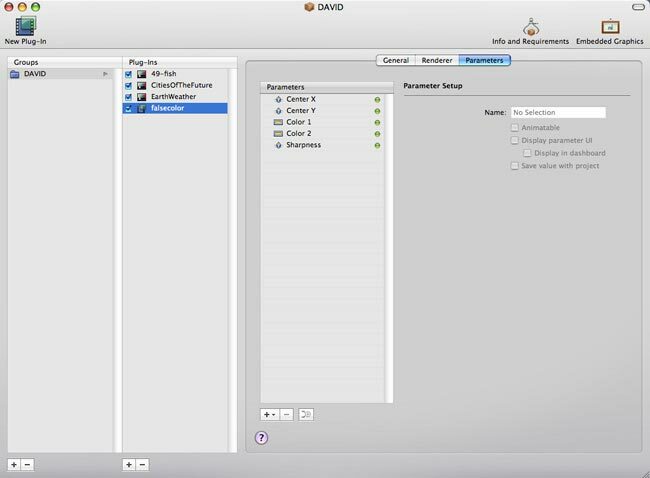 The visual effect is then available to both Motion and Final Cut Pro. A good example of third party filter is Volumetrix from iDustrial Revolution. (see lafcpug review) This volumetric light spill plug-in is a commercial offering that was produced using the workflow similar to that delineated above. The company's web site has some dramatic samples of the effect it produces. Summing Up. Whether you purchase one or more of editing and compositing packages or opt for the full authoring package, you are in for a rewarding experience with this unique application. Apart from providing over one hundred OpenGL and Core Image accelerated filters for two pro apps, the FxFactory Pro environment provides a framework for creating your own. The filters are rock solid, produce interesting results and can be tweaked to fit your projects, and shared or sold at the company web site. As such, this app is emblematic of where Apple is moving with its FxPlugin GU-accelerated pro apps architecture.